This half day event in Munich aims to simplify planning processes and to show solutions that will make planners’ lives easier. 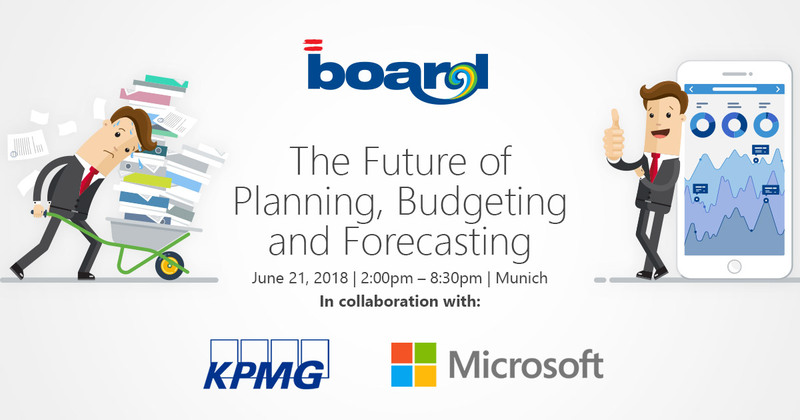 BOARD International, the leading global provider of unified Business Intelligence, Enterprise Performance Management and Predictive Analytics solutions, will run a joint event with KPMG and Microsoft on June 21, 2018, in the Munich Allianz Arena to showcase how the combination of modern technologies and best practices can help companies transform and modernize their corporate financial and operational planning processes. Experts from BOARD, KPMG and Microsoft will explore - from a managerial, functional and technical standpoint - how technologies and advanced methodologies are changing the way in which top performing organizations are structuring their planning processes. Event participants will gain concrete examples of how the Finance Team and LOBs can achieve better real-time collaboration, make better decisions and enhance company performances, by improving Budgeting, Planning and Forecasting processes. “Good planning can be adapted quickly and flexibly to changes and can map scenarios to offer a consistent, reliable basis for augmented decision-making,“ explained Dr. Justus Marquardt, a partner at KPMG AG. “The most successful companies are often innovation leaders and early adopters who use state-of-the-art technologies and innovative methods to optimize and speed up processes. With BOARD, our clients are relying on a flexible product that integrates innovations - such as advanced analytics, cognitive technologies and artificial intelligence - to deliver actionable insights which can be used quickly and intuitively,” said Ansgar Eickeler, General Manager Central & Eastern Europe at BOARD. This half day event is mainly targeted at finance managers, controllers, FP&A and S&OP managers, and the participation is free. KPMG is a global network of member firms providing Audit, Tax and Advisory services with more than 189,000 professionals working together to deliver value in 152 countries.